Night Owls aren’t joking when they list amongst their influences Nirvana and Queens Of The Stone Age; the whole of debut EP Informaldehyde steals the best aspects of both bands yet Will Pollard and Liam Waddell manage to make it unique. Following on from the other notable rock duo Royal Blood, Night Owls create an EP littered with heavy sounds, attitude laced vocals and show a band that actually has more than one dimension. Gilded Lily is the track that most encapsulates the ‘grunge-pop’ genre that the band are attempting to fit themselves into. The increasingly violent drums is matched only by the increasingly desperate screams of Pollard yet the melody remains upbeat in the strangest way, the juxtaposition only serving to make the song stand out. She sees the instrumentation put on the back burner as the lyrics take centre stage before a riff that wouldn’t be out of place on a chart hit accompanies the repeated cries of “she’s coming for you”. The real surprise on the EP though is Why Me?, a song introduced by the gentle plucking of a guitar before electric notes drown it out. The lyrics though are refreshingly fragile, making it hard to believe it’s the same band as that on the first track. Closing track Call Me Out follows the same formula of Gilded Lily, except there is an added shimmer on the guitar, yet it lacks the spark of the first track. Maybe it’s the stereotypical rock elements placed on it or maybe it’s the fact that Pollard’s voice doesn’t seem to change even if the tone of the song changes, with the heavy screams becoming tiresome. Nevertheless, Informaldehyde is a debut that marks Night Owls as ones to watch, even amongst the talented progeny that Leeds has produced over the years. 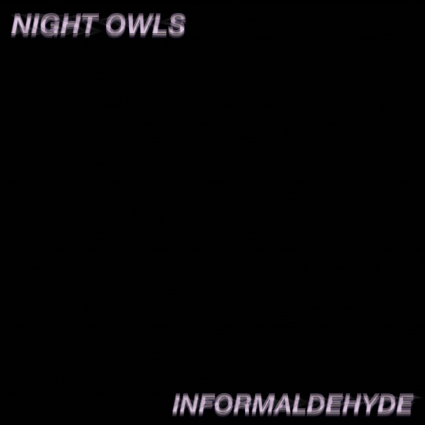 ‘Informaldehyde’ by Night Owls is out now on Till Deaf Do Us Party Records.